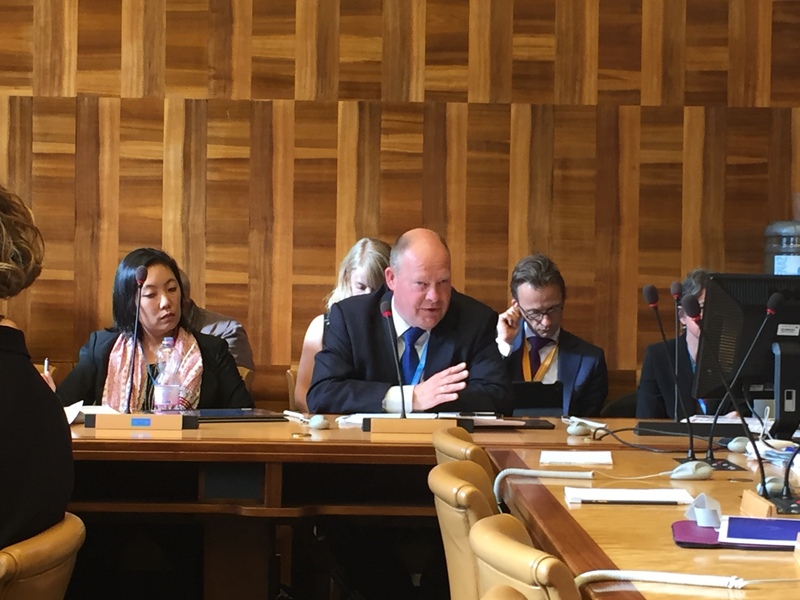 At a side event to this week’s annual World Health Assembly, a member of the Netherlands Ministry of Health delivered an unexpected speech on access to medicines, calling for more clarity in the setting of medicine prices, looking inside and outside of the patent system for solutions, and praising de-linkage. Other panellists viewed partnerships as a key ingredient to fill research and development gaps. And a representative from the Gates Foundation advised against a hasty switch to new system. Yesterday, an event co-organised by Health Action International, Medicines for Malaria Venture, and Oxfam gathered four speakers asked to discuss ways to achieve affordable access to health technologies. Herbert Barnard, director, International Affairs, Ministry of Health, the Netherlands, said he would give a developed country perspective and would share the vision that the Dutch government recently sent to its Parliament on their new medicines policy. Access to affordable medicines is no longer a challenge for low and middle-income countries alone, he said, but a pertinent issue in high income countries as well. This is an urgent challenge, he declared. The Netherlands made a submission to the United Nations High Level Panel on Access to Medicines, he said. In order to increase access, “we have to look at the widest range of possible solutions, both within and outside of the current patent system,” said Barnard. Within the patent system, “we want to encourage voluntary and non-voluntary licensing of patents and test data related to important medical innovations,” and royalty payments should reflect different countries’ ability to contribute, he said. Although patents have an important role to play in innovation, Barnard said, the Dutch government also wants to encourage the development and implementation of a wide variety of innovative financing models that do not rely on creating additional market exclusivity through patents. To put the theory into practice, the Netherlands has identified several concrete actions, according to Barnard. One of them is to have more flexible market authorisations for innovative medicines to ensure early access. Procurement platforms are expected to be set up to tackle the high price of medicines. “We will introduce new methods to develop medicines and bring them to the market by, for example, establishing conditions for research subsidies to prevent that the taxpayers pay twice for their medications,” he explained. Transparency should also be improved on costs and prices, he said, what percentage of the price is attributable to research, what percentage for development and production, and what percent is pure profit. Space needs to be created to allow for alternative business models, he said. “There are already initiatives that demonstrate that medicine can be produced with clarity on costs and how the price is set. Such initiatives deserve a chance to prove themselves, ” he said. “We believe that we can learn a lot from existing initiatives such as product development partnerships (PDPs). These initiatives show that de-linking investments from sales can contribute significantly,” Barnard said. They show that patents do not have to lead to market monopolies as long as licences are available, he added. The Netherlands currently holds the EU presidency. “The topic of affordable medicines is an important topic on our EU presidency. It is not easy, I can assure you,” he said. “Member states have a lot of autonomy in the field of pharmaceuticals and we see many differences between needs and options, or even willingness to move,” he said. His presentation was applauded by many in the audience of a packed room. Suerie Moon, co-director, Project on Innovation and Access to Technologies for Sustainable Development, Harvard Kennedy School of Public Health, said the current R&D system is broken, but it is not set in stone and thus can be changed. However, some global solutions are needed to address the issue. The patent system and the pharmaceutical industry are not inseparable, she said. Out of US$240 billion spent on health research, 40 percent comes from the public sector and philanthropic organisations, and 60 percent from private actors. This can be compared to the US$1 trillion global pharmaceutical market. A global system has to work for 7 billion people, she said. The current system has several flaws, she detailed, including the fact that it is not driven by public health needs, is based on biased publications of clinical trial results, impedes follow-on innovation, is too slow, non-transparent, and wasteful. The current system provides for high prices, the maximisation of volumes and profit, and is often inconsistent with public health goals, she said. A global agreement is needed on norms and principles, such as ethical conduct of research, affordable and equitable access through de-linkage, open innovation and data sharing, scientific rigour, and transparency. Also speaking at the event was David Reddy, CEO, Medicines for Malaria Venture. He presented PDP models which could address R&D gaps for poverty-related diseases. Malaria remains a public health imperative, he said, and although over the last 50 years there was a dramatic decline of mortality due to malaria, there is still a key R&D gap, in particular for children and pregnant women. He mentioned several partnerships, including the partnership between pharmaceutical company Sanofi and the Drug for Neglected Initiative (DNDi) for a malaria treatment (ASMQ) (IPW, Public Health, 17 April 2008) which allowed Sanofi to deliver 400 million treatment courses in 33 countries. Through public-private partnerships, de-linkage and appropriate incentives, around 485 products have been injected into the neglected diseases R&D pipeline, he said. Christopher Elias, president, Global Development Program, Bill and Melinda Gates Foundation, said there are a lot of challenges to affordable access to health technologies. Sometime fragmented, slow and understaffed regulatory systems introduce “years of delay” in terms of getting products approved not just in the country of manufacture but also in various countries and regions where products are meant to be deployed, he said. He also said that poorly financed and staffed health systems make it difficult to introduce new products. When manufacturers face unpredictability, they integrate that unpredictability into the price of their products, he said. Market shaping can reduce that uncertainty, and therefore reduce the costs of products, and greatly increase their accessibility, he added. Following a question from the audience on the UN High-Level Panel on Access to Medicines, Elias said he hoped the panel stimulates a debate that thinks about the entire system of innovation and the entire system of getting innovation to people. The challenge for the panel, he said, is to come up with a set of recommendations that does two things: “some practical recommendations on how to optimise what is clearly a very broken system, and thinking about new models by which a newer system could be created supporting innovation and access for everyone. However, he said, there should be parallel systems as it would be unhelpful to jump from the current system to a completely new one. "Unaffordable Medicines Now Global Issue; System Needs Change, Panellists Say" by Intellectual Property Watch is licensed under a Creative Commons Attribution-NonCommercial-ShareAlike 4.0 International License. Very positive to see that these speeches on access (to the products of innovation) go well beyond what the Addis Ababa Action Agenda article 116 (#aaaa116) is saying on the subject. Let’s be clear, the sustainable development agenda will not be delivered unless the flaws in the patent system will be addressed. Protection of IPR is negotiable as it is a requirement, the material boundaries of the planet and threats to our health are constraints that we cannot negotiate with nature. The figure on event complexes at http://www.ens-dictionary.info/item:business-event puts the distinction between requirement and constraint in the context of the global development agenda.